Happy Mother’s Day! 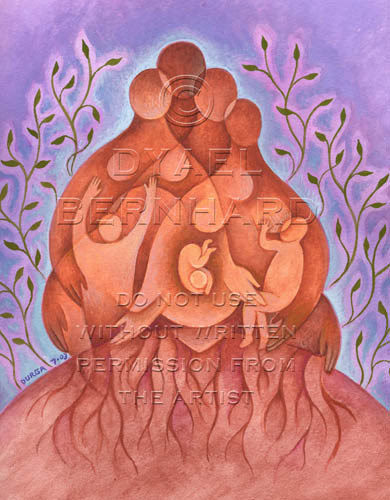 Continuing with this month’s theme of mothers and children, this illustration depicts motherhood as growing from the earth itself. Here is the soil from which children grow, from fetus to infant, from baby to toddler and beyond. Throughout their early years, children’s growth and development are rooted in the soil of their mothers. Mothers, too, grow from the very same earth. Along with her child, a mother must bear her own transformation as she matures into a nurturer and caregiver. She must learn to put her child’s needs first. She must learn from her mistakes. She must give unconditionally, and delay or even sacrifice her own gratification. Many women do not fully grow up and leave childhood behind until they become mothers. Blessed is the woman whose deep gratification is that of motherhood itself. For this mother and artist, nothing was more enriching to my soul than the gift of bearing life. Over a hundred paintings emerged from my experience of mothering three children. Two calendars were published from my collection of mother-and-child art. (If you’re interested in acquiring one, contact me – I have a few left for sale). More paintings to come, I’m sure, if and when I become a grandmother! The Bearers is available as a greeting card or poster from my webstore. Fill in the title under “Image of your choice” near the top of the page. This is so beautiful, Durga.